How is everyone doing? I'm doing pretty good. It's election day here in the good ole' U.S of A and I just got back from voting! I hope you guys all do the same, it's super important for our future! Anyways, enough political talk, here's a look I shot last week with my boyfriend. How good of a job did he do? I don't think he really had any experience with a DSLR but he rocked it! He needs a bit more practice on focusing, but I think he's killing it! He's so cute, he always helps me out anytime I need blog stuff done. I wanna do a menswear post soon with him as my model! Anyways, this look is one of my favorites. 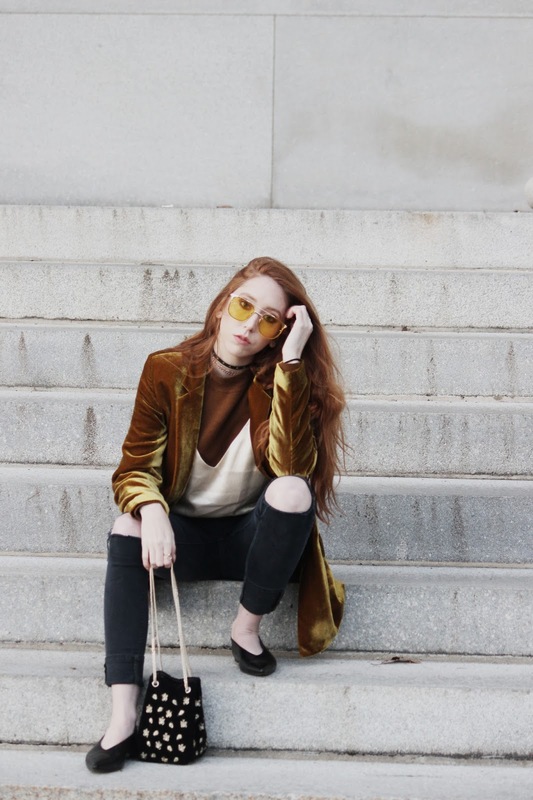 I paired this yellow/taupe velvet blazer with layers. I started off with a brown knit with a mock neck first, and then layered my satin cami on top. I finished it off with a pair of basic black skinnies, since the top half is definitely the conversation starter, my pointy black flats, and my cute little bee bag from Zara! Enjoy! I love this blazer endlessly. I can't wait to wear it a million times. 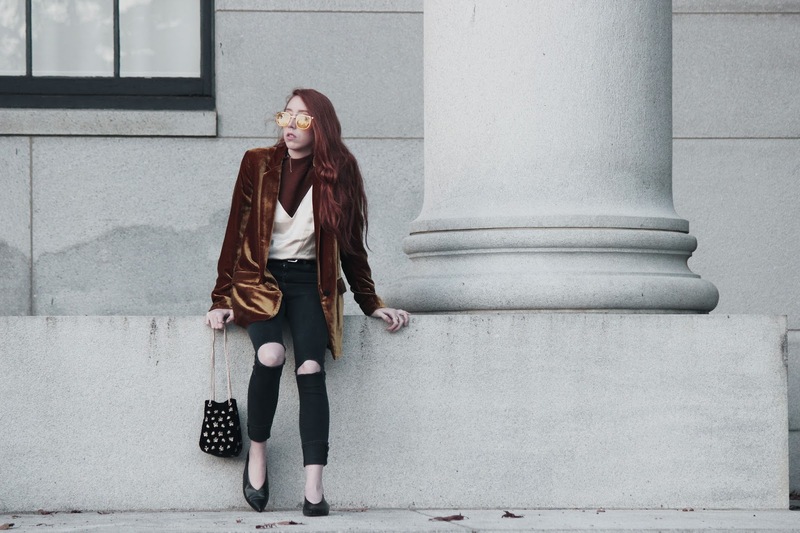 I am so obsessed with velvet, it's almost sickening. And that silk cami? It's perfect. I love layering it over t-shirts, which is super trendy right now. I'm also obsessing over the little bee bag. It's the cutest! Beautiful look, gorgeous photos, amazing blazer! 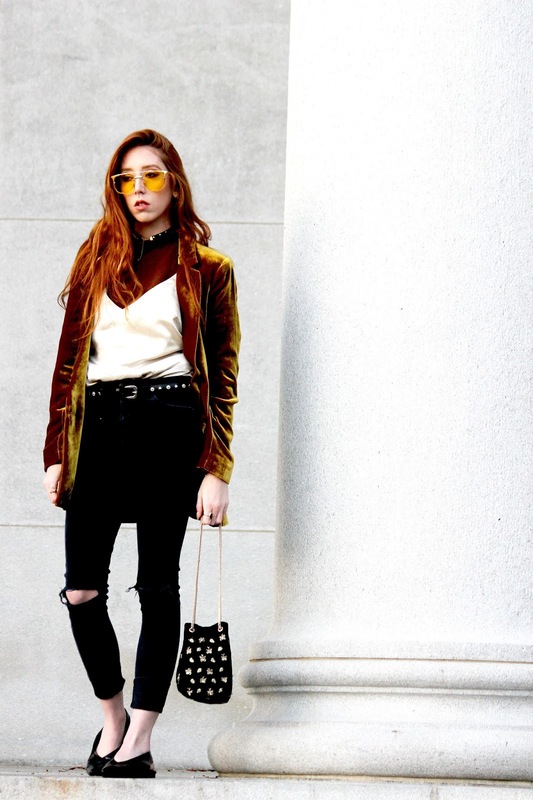 Looooove the velvet mango blazer! If ever you want to sell him i will be happy to buy him from you.